Various surgical approaches are available for operations in the region of the clivus (e.g., for chordomas or chondromas): subtemporal transtentorial, transcervical, subglossal, and rhinoseptal. Hakuba (1985) reported on the transoral approach to this region. Calcaterra et al. 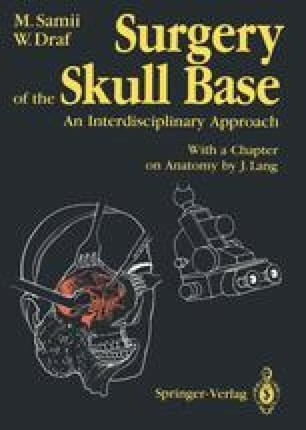 (1973) emphasized that tumors of the nasopharynx (and maxillary sinus, ethmoid cells, palate and facial region) can grow through the foramina of the skull base. They found that these lesions can spread by the perineural route without seeding metastases to regional lymph nodes or other organs. Gabrielsen and Pingman (1964) noted that the skull base tumors known as “chondromas” in the German literature are equivalent to the “ osteochondromas” of English and American authors. These tumors arise from cartilage remains of the primordial skull base and initially grow extradurally, although they can penetrate the dura. Their most common sites of occurrence are parasellar, and occasional lesions are found in the middle fossa, posterior fossa, the CPA region, about the petrous apex, and rarely in the area of the petrooccipital suture. Figure SA 75 shows how the position of the notochord changes at the craniocervical junction and in the clivus region during development and indicates the directions in which chordomas (derived from the notochord) may spread (see Lang 1986 for details). Luschka (1856) was probably the first to describe such tumors, which Müller (1858) then related to the notochord. The routes by which chordomas can spread to the posterior fossa, nasopharynx, sphenoid sinus, and the pituitary region of the middle fossa are indicated in the figure. Evidently the course of the notochord is variable in the area of its rostral end. Some researchers describe it as terminating in the area of the dorsum sellae, others at the posterior wall of the pituitary fossa (on which a “sellar spine” is occasionally seen). It appears that we were the first to describe a sellar spine, which we observed in a 23-year-old male (Lang 1977). Since then there have been numerous descriptions of a spiny process projecting into the hypophysis (e.g., Dietemann et al. 1981).